I’m on the play to lead things off, opening with a Boros Guildgate. Sam plays a Forest. Next turn, I drop a Plains followed by a Lightning Mauler, while it’s Sam that gets first blood off of a second Forest and Strangleroot Geist. Now turn 3, I summon a Firefist Striker, soulbonding it to my Mauler. That gives the Striker haste, and I turn both sideways for 4. I then add a Boros Elite and pass. Back to Sam, she plays a Simic Guildgate, then attacks for 2 with the Geist to put me to 16. After Farseeking up an Island, she ends her turn. Next turn I attack in with the trio of beaters for 7, with battalion kicking in to inflate the Elite. A Gather the Townsfolk gives me two more creatures, 1/1 Humans, and I pass. Sam blows up my Guildgate with an Acidic Slime. It’s just enough of a defense to buy her a turn- except I Pillar of Flame the Slime away. That leaves Sam open for lethal as the Striker’s battalion takes the Geist out of the blocking equation, and the first game goes to me. Sam begins the rematch with an Arbor Elf off an opening Forest, while I simply deploy a Boros Guildgate. Next turn she uses the Elf to ramp into an early Borderland Ranger. After dropping a Plains, I tap out for a pair of Boros Elites. Sensing a momentary opening, Sam attacks with the Elf and Ranger for 3, dropping me to 17. She then summons another Borderland Ranger, fetching up another land to hand. Back to me, I tap out for a Skyknight Legionnaire, whose haste lets me attack with battalion straightaway. The attack catches Sam full on the broadsides, dropping her in a stroke to 12. Now turn 4, Sam sends a Ranger in for 2 before Bramblecrushing away my Guildgate. Drawing a Plains, I don’t miss a beat, parlaying it straight into a Silverblade Paladin which soulbonds with my Legionnaire to give both double strike. I attack in with the Legionnaire and pair of Elites, and Sam gang-blocks one of the Elites with a Ranger and Elf for a tree-way trade. That keeps her out of burn range, but she’s still down to 5. A turn-5 Thragtusk gives her some breathing room, though, as it puts her back up to 10 life and gives her some defensive muscle. This forces me to attack only with the Legionnaire, but thanks to double strike this chunks Sam down to 6. She then tries to apply some pressure by attacking with the Thragtusk for 5, putting me to 10. An Acidic Slime replaces it on the back-end, and she looks to destroy my last remaining source of Red mana. I tap it in response, fueling a Boros Charm for 4. With my Legionnaire poised to deliver the coup de gras, it draws a snap concession. Anxious to avoid the sweep, Sam again leads with an opening Arbor Elf, while I counter with the Guildgate. A Strangleroot Geist follows next turn after she adds an Island, nicking in for 2. For my part, I again set myself up with a pair of Boros Elites- an ominous sight. Sam drops a Simic Guildgate on turn 3, then attacks for 2 with her Ranger to put me to 16 before playing another one (fetching her Mountain). A Skyknight Legionnaire again gives me an immediate battalion strike, smashing Sam for 8. Next turn she wisely decides to hold her creatures back, instead simply playing a Farseek for an Island and passing. A Pillar of Flame sees out the Geist threat after I play a Slayers’ Stronghold, neutering its undying by removing it from the game entirely. I attack for another 8 thanks to battalion, and Sam trades an Elf and Ranger for a Boros Elite, going down to 7. I simply summon a replacement model, and pass the turn. A turn-5 Deadeye Navigator gives Sam some muscle, but it takes a moment to realise that I’ve got lethal on the board thanks to the Stronghold. One of the worries I have when reviewing decks is that a deck will pull a Jeckyll-and-Hyde, reinventing itself entirely between its turn as foil and its turn as the subject of a playtest. No preconstructed deck is immaculately tuned for maximum consistency, some much less so than others, and it would be unfortunate to give a deck a grade only to find that when my opponent is playing it it posts dramatically different results. This is more anxiety than anything else; by now we’d like to think we’ve become fairly skilled at what to expect from a deck, and between analysis and playtesting we’re usually in the ballpark of what a deck’s capable of if you were to play it another fifty or a hundred times. Still, it’s always especially gratifying when a a deck lines up equally well in both roles, and that was certainly the case here. Including the pregame friendly, the Boros went three-for-four in our playtest of Thrive and Thrash, and today’s game was a virtual mirror image. If anything, Rally and Rout actually did a little better this time around, winning a turn or so quicker on average. The deck really is that explosive. It’s hard to find much fault with the deck that doesn’t sound overly nitpicky, since it does a single thing (weenie rush), and does it exceptionally well. The deck’s mana curve is aggressively-costed, and there’s little difficulty in deploying a rapid stream of threats that can overwhelm your opponent quite quickly. There’s a fair amount of removal, though I’d probably have been a little happier with extra burn instead of Gather the Townsfolk, which seemed like over-insurance for an unlikely contingency. Certainly there’s plenty more in the sideboard, so there is that. With all this Boros love, where then are the deck’s flaws? For one thing, I never liked playing Boros Guildgates. Though I was able to recover well thanks to double-drops of the Boros Elite each time, you won’t always be so fortunate. In a deck like this every turn has to count, and dropping a land then shipping the turn feels like a missed opportunity. 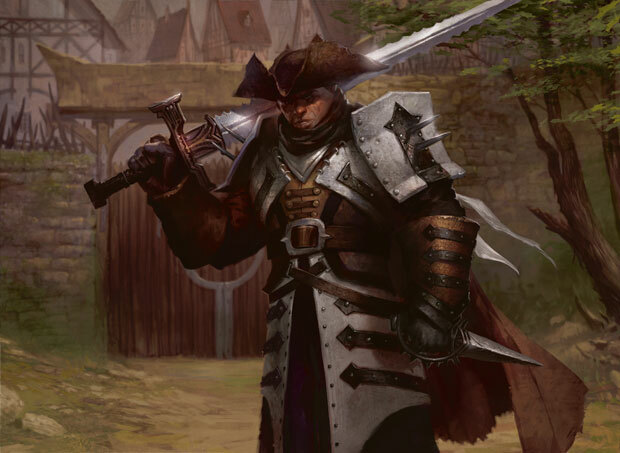 Although there’s never a perfect solution, and Wizards has to work within certain constraints, I’d have happily swapped out Thalia, Guardian of Thraben’s rare slot for another Clifftop Retreat, then replaced the creature hole with a Skyknight Legionnaire. The real answer, of course, is to simply replace the Guildgates with what they dream of being- Sacred Foundries– but that’s beyond our remit for the purposes of reviewing the stock deck. Another thing I noted with the deck was that it felt a little inconsistent, thanks in part to a number of different singletons. Sure a turn-1 Champion of the Parish is superb, but it gets less attractive as the game goes on. The Silverblade Paladin and Ash Zealot too seemed a bit situational. The Paladin in particular is superb if you’ve got a Skyknight in play, but somewhat less impressive in a deck loaded with ground troops that tend to be on the smaller side. Again I also could have happily cut two Gather the Townsfolks for two more Boros Charms. Not in any way to compare, but I couldn’t shake the feeling that the Boros meddling I did for Gathering Magic had some elements to it that worked better than Rally and Rout. Your mileage, of course, may vary. Impressive deck. Feels good on paper and on the table. I agree with you about the guildgates, too slow for a boros deck. Otherwise, i really like the rares, all of them are pretty cool. Whereas I agree with you on the guildgates, This also shows that either simic was the wrong choice to put up against Boros, or the Simic deck was not well thought out, as out of 8 games it lost all but 2. This deck also shows the power of the drop and go strategy that Red/white seems to excel at which is what is making Boros the most popular Spike Guild. The fact that there is no one card to blame(team ups to blast away unlike Caw-blade or Delver-snap) really means there is going to be a sameness of decks in most FNMs and no innovation. Jay, thanks for your write-ups. I’ve never been tempted to read the accounts of chess matches, for example, but you manage to make the battle stories very entertaining. I also found myself wondering whether your meddled Boros intro deck would fare as well or better than the base Boros event deck. Even with the additional rare cards in the event deck, it seems like your lean and mean meddled deck might take a few rounds from the event deck going head to head. Any chance that you did any such testing in the lab? What do you see as the best meddled intro deck to derail the Boros juggernaut? My son and I have had some epic battles using the base intro Dimir, and it more than holds its own against the base Boros intro deck. 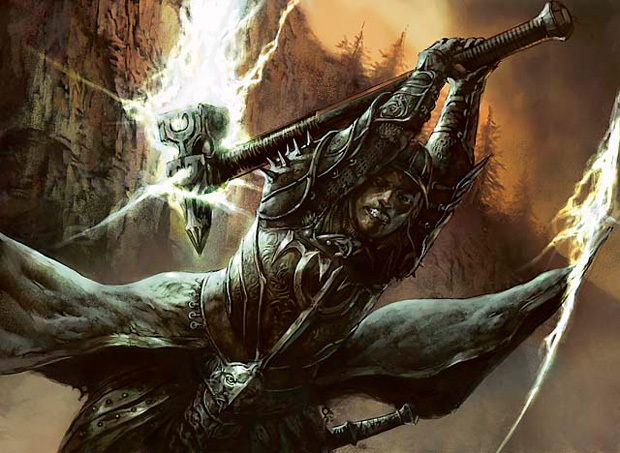 We’re awaiting your thoughts on meddling that Dimir deck…. Hard to say. I’d love to, but things are pretty crazy on our end right now. In fact, the only games we play of MtG as late are the ones for this site! As for the Boros-beater, you need something that can either stand up to or outlast the early rush. My instinct tells me that the Orzhov, too, can hold their own when properly tweaked. Set up some early defenses, then use extort to stay healed out of burn range, it certainly has promise! Definitely looking forward to meddling the both of those. I would like to see the base Boros vs a premium deck, such as, Slivers or Graveborn. With the Slivers being a slower deck than Graveborn, I would like to see that one be tested by some Event decks. I’m building a nasty Zombie deck using Endless Ranks, Unbreathing Horde, rooftop storm, cemetery Reaper, diregraf captain, Sorin’s Vengeance, Army of the Damned, Call to the Grave, Grimoire of the Dead,and etc. Almost all the cards are rare and some are uncommon. Not bragging bout the fact that they are all nearly rare but it was a matter of finding great cards to compliment the style of this deck. Low cost great abilties that will build my zombie army. Some cards are a little costly in the mana departed but rooftop srorm will allow me to play my creatures for free and leave me mana for spells,enchantments,and artifacts. Sorin’s Vengeance is a great card to use as a game ender or game changer, plus it adds just a dash of burn and gain life. I have an omniscience, but decided to just go with the Rooftop Storms, as it is cheaper in mana cost but it also goes with the zombie theme much better. Geth, Lord of the Vault is another I am using in the deck along with Mikaeus, the Unhallowed, Grimgrin, Corpse-Born, and Zombie Apocalypse. This is a devasting zombie deck. A lot of Zombies are 3 mana and of course I have 4 Gravecrawlers. So, I know its not a precon or event, but how do you think it will hold up? I have always liked Boros and I really liked the Event Deck although I definitely agree with your coments. I found a Boros deck benefits from Angels, ALOT. Sub out some of the ground creatures for some flyers such as Firemane Avenger and you will really improve the deck. Obviously Aurelia helps, but Avacyn, Angel of Hope is another great (although expensive) option. Even better is added Gisela, Blade of Goldnight to double your destruction while halving your opponents attacks you won’t block because your tapped out. I’ve been playing magic 2012 on my pc back in 2011. recently started playing it again. i really love magic the gathering so i bought this deck to play in a store nearby (going to do that tomorrow). i quicly replaced a townsfolk and a pillar of flame with 2 bonds of faith. wich in my opinion is a better since you pump up so many humans in this deck and having the option to either buff your creatures or make an enemy creature useless.